Sir Isaac Newton PRS MP (25 December 1642 – 20 March 1727) was an English physicist, mathematician, astronomer, natural philosopher, alchemist and theologian, who has been considered by many to be the greatest and most influential scientist who ever lived. His monograph Philosophiæ Naturalis Principia Mathematica, published in 1687, laid the foundations for most of classical mechanics. In this work, Newton described universal gravitation and the three laws of motion, which dominated the scientific view of the physical universe for the next three centuries. 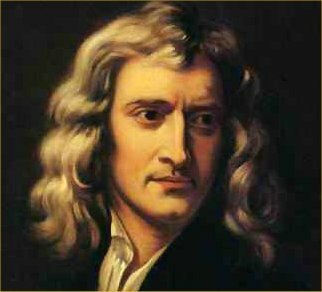 Newton showed that the motion of objects on Earth and that of celestial bodies is governed by the same set of natural laws: by demonstrating the consistency between Kepler's laws of planetary motion and his theory of gravitation he removed the last doubts about heliocentrism and advanced the scientific revolution. The Principia is generally considered to be one of the most important scientific books ever written, both due to the specific physical laws the work successfully described, and for its style, which assisted in setting standards for scientific publication down to the present time. Newton built the first practical reflecting telescope and developed a theory of colour based on the observation that a prism decomposes white light into the many colours that form the visible spectrum. He also formulated an empirical law of cooling and studied the speed of sound. In mathematics, Newton shares the credit with Gottfried Leibniz for the development of differential and integral calculus. He generalised the binomial theorem to non-integer exponents, developed Newton's method for approximating the roots of a function, and contributed to the study of power series. 496 – Clovis I, king of the Franks, is baptized into the Catholic faith at Reims, by Saint Remigius. 1261 – John IV Laskaris of the restored Eastern Roman Empire is deposed and blinded by orders of his co-ruler Michael VIII Palaiologos. 1837 – Battle of Lake Okeechobee. 1968 – 42 Dalits are burned alive in Kilavenmani village, Tamil Nadu, India, a retaliation for a campaign for higher wages by Dalit laborers. 1989 – Nicolae Ceau?escu, former communist President of Romania and his wife, First-Deputy Prime-Minister Elena are condemned to death and executed after a summary trial. 2012 – A military plane crashes while descending toward Shymkent, Kazakhstan, killing all 27 people.